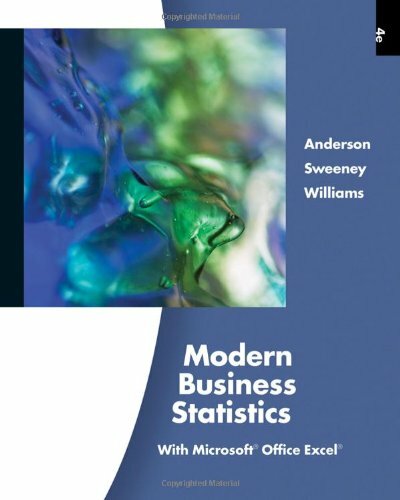 Use MODERN BUSINESS STATISTICS,4th Edition to gain a strong conceptual understanding of statistics with a balance of real-world applications and focus on the integrated strengths of Microsoft Excel 2010. To ensure your understanding, this best-selling, comprehensive text carefully discusses and clearly develops each statistical technique in a solid application setting. Immediately after each easy-to-follow presentation of a statistical procedure, a subsection discusses how to use Excel to perform the procedure. This integrated approach emphasizes the applications of Excel while maintaining a focus on the statistical methodology. Step-by-step instructions and screen captures further clarify the presentation to ensure your understanding. A wealth of timely business examples, proven methods, and application exercises clearly demonstrate how statistical results provide insights into business decisions and present solutions to contemporary business problems. The book's class-tested problem-scenario approach emphasizes how you can apply statistical methods to today's practical business situations. New case problems and self-tests throughout this edition allow you to check your personal understanding. Additional learning resources, including CengageNOW for online homework assistance and a complete support Website, provide everything you need for the Excel 2010 skills and understanding of business statistics that is SIMPLY EXCELLENT! Anderson, David R.; Sweeney, Dennis J.; Williams, Thomas A.
Anderson David R.; Sweeney Dennis J.; Williams Thomas A.